Quivo (pronounced –QWE-VÖË), is a vibrant café styled restaurant in the heart of Kuala Lumpur, Pavilion. The mall is home to many unique restaurants, however Quivo is one of my favorites. At it’s peak hours it is nearly impossible to get a table. At night, the ambience is very lively, with people talking over food while the chefs openly cook your food, offering indoor and outdoor seating. The restaurant’s interior fits with the mediterranean theme perfectly as there is a wood-fired pizza oven and a mediterranean painting along one of the walls. The drinks are served in a jar shaped mug. After trying the lemonade and the fruit ice tea, I was amazed. The lemonade had a good balance of citrus and sweetness, and the fruit ice tea had a refreshing and fruity taste. After quenching my thirst, I moved onto appetisers. I tried the prawn gambas, which were accompanied with some bread and potato wedges. The prawns were cooked to perfection, and the portions were quite generous, the garlic and chilli added an extra hit of flavor. Even though prawn gambas is originally a hispanic dish, Quivo has been able to put their own mediterranean twist on it. Next, I tried the tuna ceviche. The ceviche was served in a coconut, again adding to the mediterranean feel. This tuna ceviche, in particular, was unique. I have never seen anyone put guacamole in tuna ceviche, which elevated the dish to a whole new level. The additional chips and lime also complimented the dish positively. Following the tuna ceviche, I tasted the fajitas. This dish was especially innovative as Quivo managed to transform another hispanic dish into a mediterranean dish. Instead of using a classic tortilla wrap to hold the meat; steaming hot, soft pita bread took its place. In addition to the traditional guacamole and salsa, there was an option to add hummus to your fajita. The chicken filling for the pita bread was tender and served on a sizzling platter. The combination of hummus, guacamole, salsa, pita bread and sizzling chicken was gastronomic. Next came a chicken burger. The burger buns contained slices of jalepeños embedded in them. This added a subtle but noticeable hint of flavour. The actual chicken in the burger was tender and crispy, with a cheese sauce on the side to add an extra kick of flavour. By far, my favourite item on the menu was the greek lamb kofta pizza. The pizza is cooked in a traditional wood-fired oven. The lamb kofta, or balls, were moist and fell apart in my mouth. The pizza crust did not disappoint. It was perfectly baked, crispy and did not dominate the lamb kofta. Finally, for dessert, I tried the chocolate sphere. At first, the waiter served it as a whole chocolate sphere on top of a moist chocolate cake with ice cream, however, he returned with piping hot chocolate sauce. 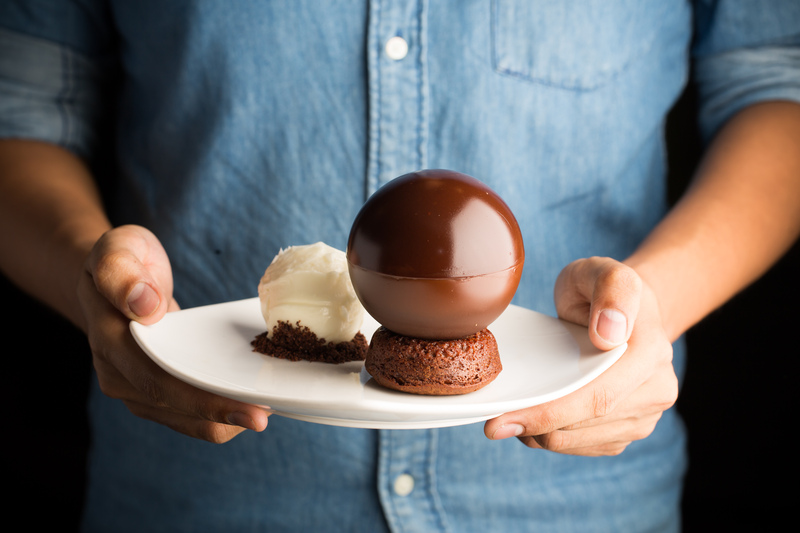 As he poured the chocolate sauce over the sphere, it started to melt to reveal a chocolatey filling. The chocolate sauce from the melted sphere drizzled all over the chocolate cake, encasing it with chocolate sauce. Over the past year, their menu has changed drastically with the addition of new culinary treats such as the chocolate sphere and the tuna ceviche. H4H 40 Hour Famine: is it Worth it?